Welcome back! 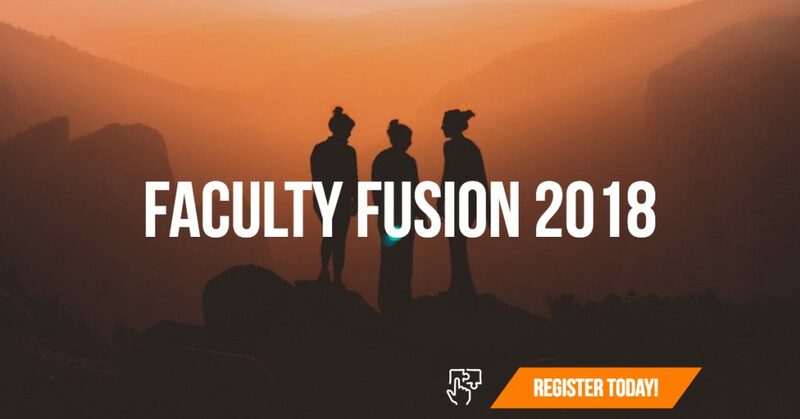 Join us as we kick off a year of thinking and learning at Faculty Fusion on Friday, August 17, 2018. Friday morning we’ll offer sessions on various teaching strategies, and then, on Friday afternoon, we’ll have an extended training session with Sally Gary, focusing on extending hospitality and welcome to our students. We look forward to thinking and learning with you. Breakfast, lunch, and snacks will be provided. You can RSVP for activities here, by emailing rsvp2ac@acu.edu, or by calling the Adams Center at 325-674-2455. Registering saves your spot in each session and allows us to know how many to expect. We look forward to seeing you! You have probably heard — or even experienced — some “teacherless” online courses that reduce the learning experience to reading and quizzing, including little interaction and community building. Join us to learn ways to “humanize” your online courses by adding more social presence while enhancing learning. The Socratic seminar method is an interactive seminar model used to promote critical thinking that provides a safe environment where students can engage in meaningful and respectful dialogue. Join us to hear how we’ve used it in our classroom and learn techniques to integrate into yours. The Adobe Education Exchange helps ignite creativity in classrooms worldwide by connecting the education community through professional development, teaching resources, and peer-to-peer collaboration. Everyone at ACU has access to Adobe Education Exchange — come to find out how it can enhance your teaching and learning experience. Students often enter our classrooms with little understanding of how they learn. Join us as we dispel student studying myths, explore the science of how the brain learns, and consider ways to help students master material. ACU has excellent teaching all over campus. Join us for a panel discussion and conversation on excellent teaching, where we’ll talk about both successes and flops. Come to find out what we’ll be reading in our three reading groups this fall and share what’s been on your reading list this summer, from heady academic reads to pulpy beach fiction. Faculty across campus are producing video lectures to present content, introduce a project, or demonstrate new skills. Come to hear from faculty who use video to support student learning and the software that makes it all possible. As a faith-based university, it is essential that our classrooms are spaces of belonging for all students. Not only is belonging essential to the ability to learn, it allows us to model Christ in our classrooms, and it creates an environment of trust among students and faculty. Please join us as Sally Gary and Laura Carroll lead an afternoon of Christ-like conversation, grace-filled dialogue, and respectful disagreement, where we will consider how to welcome others well at ACU. The conversation with Sally Gary will continue on Saturday morning at the Adams Center from 9:30-noon, including table discussions with staff and students.